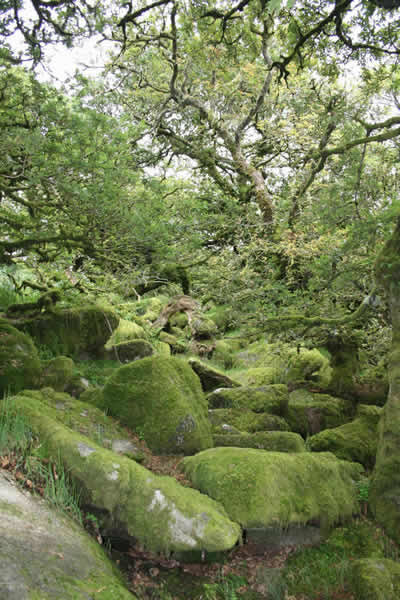 Like many places in Dartmoor, Wistman’s Wood has an abundance of myths and legends. Druids once held rituals here; maybe some still do. At night, the wood is haunted by a pack of hellish hounds (is there any other kind on Dartmoor?) More commonly seen are the two-legged beasts that appear daily, wearing brightly coloured anoraks – the wood is a short hop from the hamlet of Two Bridges, and consequently one of the national park’s most popular short walks. Our route headed beyond the trees as we continued our south–north trip across the full expanse of Dartmoor. 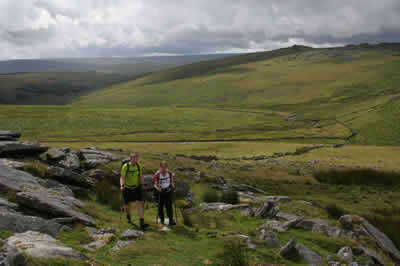 During the first day’s route – from South Brent to Princetown – Gary, Matt, Sophie and I had ticked off many of the region’s must-sees – Dartmoor ponies, wild horses, ancient settlements, a leat, and the inevitable wet feet. We hoped to claim more on our way north to Okehampton. But immediately north of the wood is a large, empty stretch of moorland – little of note apart from the posts marking the boundary of the Ministry of Defence land. We plodded on dutifully, stopping at times to shelter from the drizzle and add layers of clothing, wondering silently if it really was the height of summer. After a couple of hours of walking, the landscape became more interesting – the famous tors came into view, their rocky summits pricking the otherwise flat horizon. While resting at one of these, we came across another Dartmoor peculiarity, hidden beneath a stone. Letterboxes are small boxes hidden away on the moor, with a message for the finder. 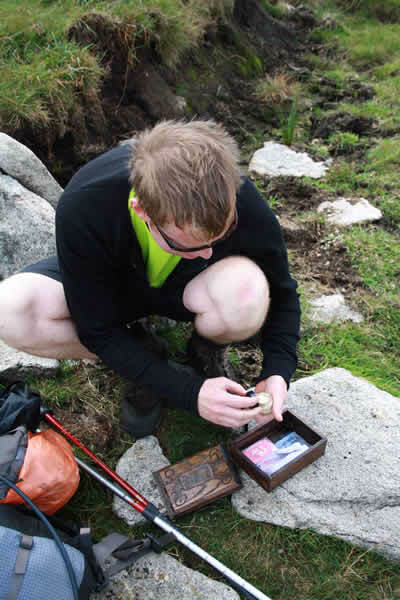 People make a hobby of roaming Dartmoor looking for them; this one had been left by a Duke of Edinburgh’s Gold group. It would spoil the game to reveal its exact location – the fun is in the finding. We descended towards Okehampton, but no chance of a leisurely finish. Gary realised that the last train to Exeter on the Dartmoor Railway would soon be leaving. Recently, there would have been no passenger trains at all – the line was only used to transport ballast from Meldon Quarry – but in 2011 it was reopened by volunteers who run Summer Sunday services and it is proving successful. Hopefully this popularity will see the service restored full time in the near future. We raced through Halstock Woods, a patch of deciduous trees outside Okehampton that bookended our day nicely. The train pulled up just as we arrived at the station, each carriage crammed with people returning from a day in Exeter and a similar number crowding the platform, waiting to return to the city. Having walked across the full extent of the moor, we completed our journey with just five minutes to spare; now that’s a real Dartmoor legend.